The Jewish Women’s Foundation (JWF) of South Palm Beach County hosted its 2018 Granting Wishes Cocktail Reception on March 14 at Boca Rio Golf Club. More than160 guests from across the Jewish community were the first to learn about JWF’s $105,000 2018 grant awards to organizations in the local community and in Israel. 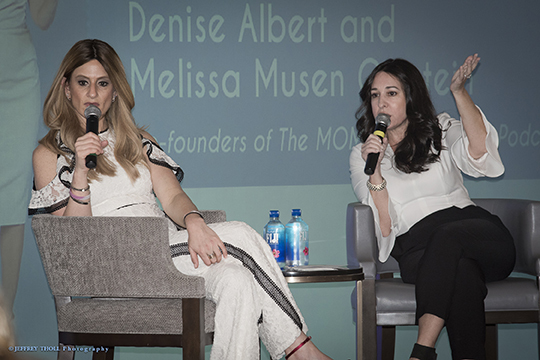 They also enjoyed hearing from award-winning Jewish journalists Denise Albert and Melissa Musen Gerstein, who co-founded The MOMS multi-platform lifestyle brand. Many thanks to Amy Rosenberg and Randee Rubenstein, who co-chaired a wonderful evening, and to the participating corporate sponsors: Greenspoon Marder, 2018 Jacobson Jewish Community Foundation sponsor; Boca Raton Regional Hospital Foundation and Brown's Interior Design, JWF Granting Wishes Reception sponsors; The Boca Raton Observer, Exclusive Magazine Sponsor; and Southern Glazer’s Wine & Spirits, In-Kind Sponsor. For information about JWF or becoming a Trustee, visit jewishboca.org/jwf or contact Lisbeth Rock at 561.852.3188 or lisbethr@bocafed.org.